If you’re like most of us, a great chunk of your day is spent sitting in an office, at a desk, banging out copious amounts of work. In order to pull off this level of commitment day in and day out, there are a few items that you need to survive. 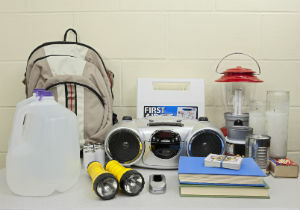 Though survival items may vary based on personal wants and needs, below are a standard few, provided by the BlackEnterprise.com team, which can serve as a baseline to build from. Have you ever been caught in the middle of the work day with a dead cellphone? The thought alone is terrifying. Staying hydrated works wonders for focus. If things get hectic on the job, you may be forced to skip lunch. Fret not–there’s a stash of trail mix and a Blow Pop in your desk drawer. Sometimes your lunch misses your mouth. If you’re one of those people who doesn’t have the luxury of eating lunch away from your desk, it would behoove you to have a stash of plasticware–forks, spoons, and knives–at your desk. Because you’re at work, and there are other people there with you. Sometimes your neighbor’s lax day coincides with your hard deadline–be prepared. Just because you have deli food for lunch, doesn’t mean it can’t be tasty. Because no one needs to know you had broccoli for lunch. For when your hand grazes something sticking and unidentifiable under your desk. There is nothing worse than being ill-prepared for that spontaneous thunderstorm atÂ 5:29 p.m.
You never know where the day will take you. For when you need to jam out in the middle of the workday, and would prefer to not disturb your coworkers while doing so. Water spills, sauces drip, crevices that need cleaning, hands that need wiping–get you some. Take your hand right now, and wipe it across your desk. You didn’t know all of that filth was even there, I’m sure. Know that you know you can’t pretend that you don’t know, so clean it up. Ever been stuck at the office during a blackout? Listen, you never know–stranger things have happened. Working silently for extended periods of time can have its repercussions. Sitting there all day can cause you to think that you’re looking one way, when you’re really looking another. Give yourself a quick decency check before heading to your next meeting. Not sure why offices find it necessary to maintain Arctic temperature levels, but they insist. Because sometimes your body turns on you midday. Are we missing anything? Let BlackEnterprise.com know what’s in your office survival kit in the comments.